A team of scientists in charge of studying the effect of global warming discovers a “red” glacier which seems to be covered with a new type of organic matter. This monster film brings us to a station in the middle of the mountain, at the foot of an astonishing red glacier. It quickly turns out that the glacier is in fact invested by a strange organic disease. The atmosphere reminds, of course, of the legendary The Thing, since both stories happen in remote base in a polar environment. Same as in the latter, the monsters are truly the highlight of the film. The virus, or whatever it is, creates hybrids of animals that are just candies for the eyes. Amongst others, get ready to meet the really ugly fox/beetle hybrid, the insect-like hawk and even the unbelievable flying ibex! I personally haven’t been excited by such a set of inventive monsters since The Mist, to which The Station resemble by many aspects….and never fell short in comparison. 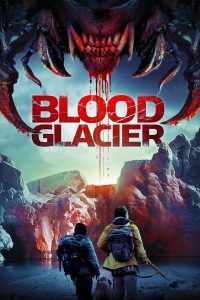 But Blood Glacier distinguishes itself from the pure monster genre by bringing a fun aspect to the story: a team of wild characters. Without ever crossing the line to the comedy genre, the film keeps surprising by depicting the sometimes tragic, but often hilarious, reactions of the characters when faced with horrific monsters which populate the mountain. This blending of The Thing and The Mist gives a highly entertaining result and, so far, Blood Glacier stands as my favorite for the fight of the best 2014’s horror release!